Mostly grown as annuals although Nemesia strumosa can be grown as perennials in warmer climates. A bushy plant that flowers from spring through summer, they are a very colourful plant for a warm sunny position with some protection from the heat of the afternoon sun. Also known as Pouch Nemesia for the shape of the flowers. Fast growing and with very colourful flowers it is the cultivars that are mainly offered for sale in nurseries. Related to snapdragons as can be seen in the resemblance in the flowers. In a mass display, plant at around 10 – 15 cm apart. Best planted in a cool position in the garden in a humus rich soil with regular applications of liquid fertiliser. Extra water will be required in warmer summer periods. Nemesia strumosa grow well in the garden border and look great when used to underplant roses. They also perform well in containers and hanging baskets. Position – Nemesia will grow in in full sun, however they do need protection from very hot afternoon sun. Soil – Humus rich well drained and moist. Fertiliser – A liquid fertiliser in spring and then every three weeks will assist with growth. Wisley Vanilla – Whites flowers with a Vanilla perfume. Blue Gem – Good mid blue flowers. 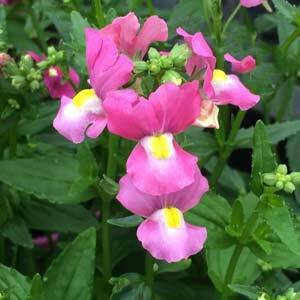 Carnival Mix – Larger flowers than many on a compact plant. Fire King – Brilliant red flowers. KLM – Blue top petals with white lower petals. Sundrops – A good mix of colours, reds, orange and whites. Seedlings are readily available from nurseries, Nemesia strumosa can also be grown from seeds. Propagation from seeds is common. Seeds can be sown indoors in winter for spring planting, or directly to the garden for summer and autumn flowers. When first planting, pinch out the tips of the plants to promote a bushy growth habit. This can be repeated until late spring. Nemesias will flower in summer. After the first flush of flowers, trim or prune then back and they provide a second flush of flowers in early autumn.